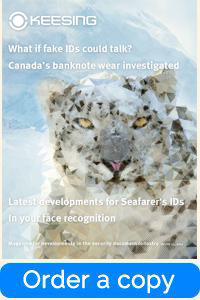 Missed a copy of Keesing Journal of Documents and Identity? Would you like to order a single issue or a copy of a special edition of Keesing Journal of Documents and Identity of your choice? Order your copy now for only € 65,- (excluding VAT and shipping). 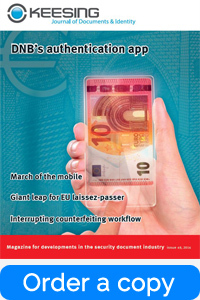 This issue of Keesing Journal of Documents and Identity features, among other topics, the seventh article from Zlotnick, Brough and Eberhard on a novel security design strategy to combat counterfeiting. 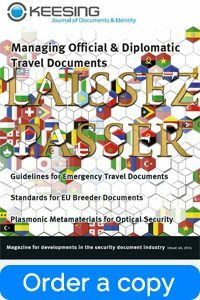 Get a better view on border management issues in the world and learn more about the future challenges in identification management. In this report you can find in depth articles, written by experts from all over the world. All articles focus on current topics. 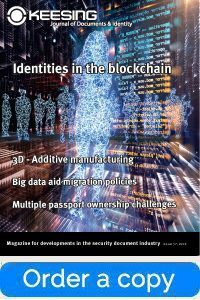 Can an identity scheme which is privacy-friendly be defined in a blockchain environment? Is Additive Manufacturing or 3D printing disruptive for the security industry and what are the threats and opportunities? How can Big Data aid migration policy makers? Read all about this and more in the latest Keesing publication, Issue 57. 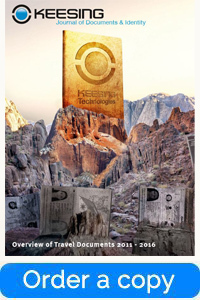 This special edition of Keesing Journal of Documents and Identity gives an overview of newly released travel documents. It will be the 14th edition and contains hundreds of new ID documents issued by more than 210 authorities in the past 5 years. 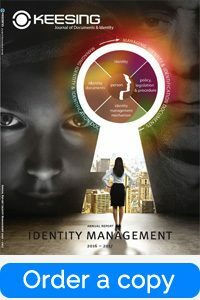 In this issue the whole breath of the identity development spectrum has been covered. Going way back to the history of passport design up to the futuristic sci-fi realm of face recognition on drones. Transliteration is another interesting subject covered in this number which is a ‘must read’ issue at present. All in all, a variety of interesting topics have been bound in this ‘must have’ work to ensure impactful and insightful reading. 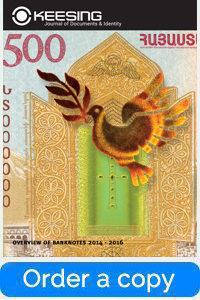 Banknote design in the past 3 years has seen various developments which all came together in the Armenian 500-dram collector’s note such as improved varnishing for longer lasting currency, tactile feature for the visually impaired, attractive windowed security and remarkable optically variable features with dynamic ink also observable in 28 of the 103 banknotes printed in 2017 and listed in the overview. 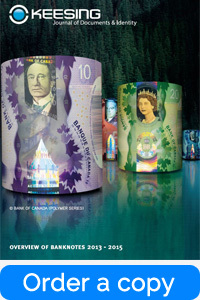 Get up-to-date with the latest banknote developments and order your copy today. Biometrics, also in 2018 will increasingly take centre stage as more and more processes are linked to biometrical verification. 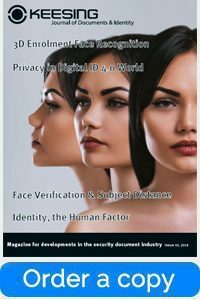 In this issue “Face Verification” is the focal point, with articles such as 3D enrolment improves face recognition, Face verification robustness & camera-subject distance and Pay-by-Face! 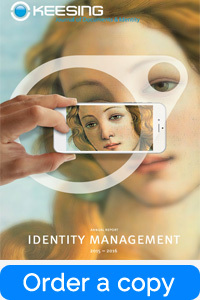 We are glad that in this year’s Annual Report on Identity Management, we have the privilege of having many experts writing articles on the seven aspects of the identity management model that we drew up in 2010, now an icon of the Annual Report of Keesing Journal of Document and Identity. Will the term “Documents” change, to compromise other forms of identity proof? And will the booklet be replaced in 2032? 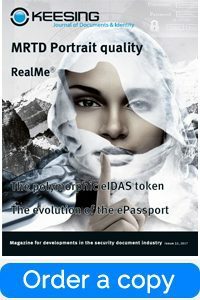 In the near future, various tokens will probably emerge as proof of identity. 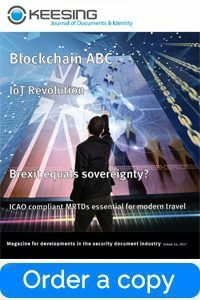 However, recent changes in extension of the ICAO specifications show it takes considerable time for even smaller changes to become fully effective. 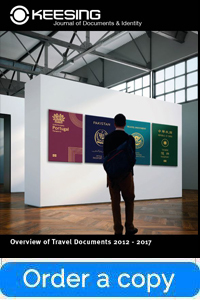 This special edition of Keesing Journal of Documents and Identity gives an overview of newly released travel documents. It will be the 13th edition and contains hundreds of new ID documents issued by more than 200 authorities in the past few years. In Issue 53 we have once again covered a great many interesting articles. To highlight a few, such as a report resulting from a decade of monitoring from the Bank of Canada on paper versus polymer wear and tear. Forensic document profiling using the still somewhat unconventional chemical approach as an addition to the traditional visual and physical examination in order to provide a more complementary and holistic approach to an investigation. Also take a closer look at the modernisation of the Seafarer’s ID and the Convention No. 185. 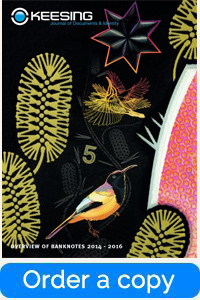 This year Keesing Journal Overview of Banknotes focuses on the artwork of banknotes. Design varying from traditional to contemporary, a diversity in printing techniques and substrates from paper to polymers. This issue covers various aspects of our identity. Our identities represent who we are and therefore deserve a lot of attention. Imagine what could happen to you if your identity was stolen and misused for purposes you would never associate yourself with. Order the Keesing Journal Annual Report 2016 – 2017 here! This special edition of Keesing Journal of Documents and Identity gives an overview of all the developments and highlights of 2016. It’s the most popular issue of the year, including the famous vendor overview. 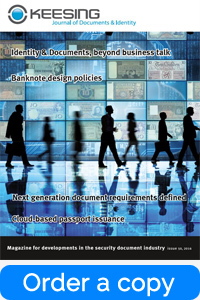 Developing security documents is a constant rat race between the good guys (the document experts) and the bad guys, who constantly attempt to forge, counterfeit and imitate ID documents and banknotes. We aspire to always be one step ahead of them with new technologies, newer materials and to constantly check our own attitude. How do we use all these techniques in a responsible manner? View a content page here. 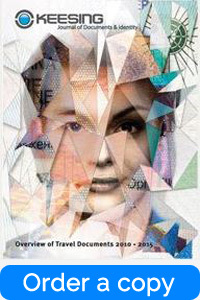 This special edition of Keesing Journal of Documents and Identity gives an overview of newly released travel documents. It will be the 12th edition and contains hundreds of new ID documents issued by more than 200 authorities in the past few years. Issue 50 targets banknote design and its policies. It also covers the new cloud-based passport issuance systems. Because it is the 50th issue, a couple of special tributes can be found throughout the magazine. 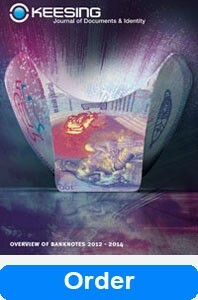 Each year Keesing Journal of Documents & Identity publishes an overview of banknotes of the past two years. This year we discuss the rise of the polymer banknotes and of course all new banknotes of 2014 – 2015. 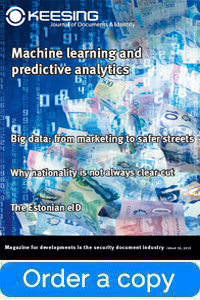 This issue targets among other things the march of the mobile bioometrics in banking and payments, the new European Union laissez-passer and DICE, the banknote of the future. You can download the content overview page here. With the influx of refugees and the counterterrorism measures, identity plays a crucial issue around the world more than ever – are people who they say they are? 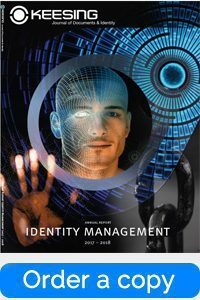 The issue focuses on Identity management 3.0 and the rise of a virtual passport; what are the pros and cons and how will it develop in time? Will we still need our passport booklets when crossing borders? Or will our faces become our passports? Furthermore, Cupertino Courgel discusses the visa system in Angola in an interview and we give an overview of the year 2015. You can view the content page here. 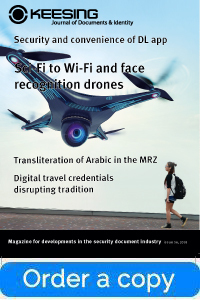 This issue covers in-depth articles on emergency travel documents , plasmonic metamaterials and near-infrared active personalisation. 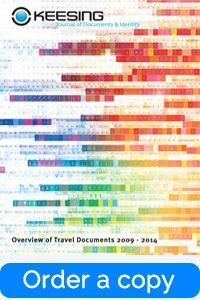 This special edition of the Keesing Journal of Documents & Identity gives an overview of newly released travel documents from 2009 to 2014. 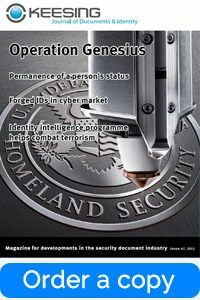 This issue covers in-depth articles on the Cybermarket for forged identity documents, direct -write printing and advanced hologram technology. 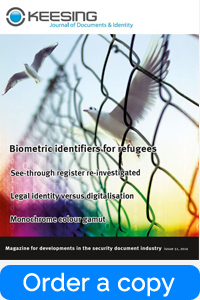 Learn more about the US biometrics and identity intelligence programme part 4. 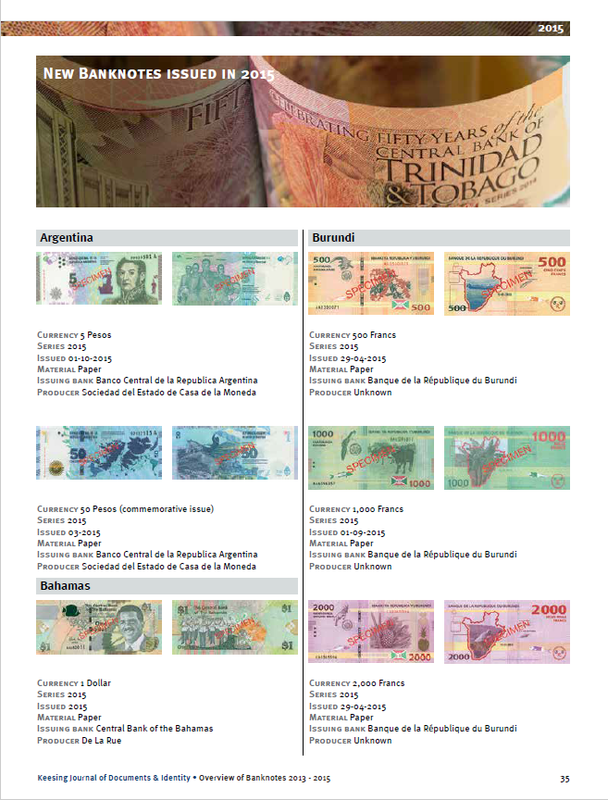 This special edition of the Keesing Journal of Documents & Identity gives an overview of newly released banknotes from 2012 to 2014. 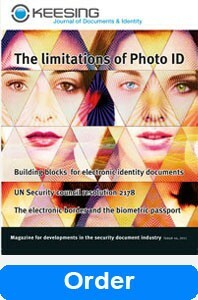 This issue covers in-depth articles on the UN Security Council Resolution 2178, attributes and credentials and e-Passport authentication. 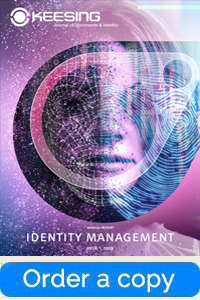 Learn more about the US biometrics and identity intelligence programme part 3. To order any of the other previous issues, special editions or for information about advertising in the Keesing Journal please contact us.